Music is an important part of many people's lives. Whether recalling good times or bad, most people remember a certain song that was playing in the background. Music is tied into human emotion and can make a person happy, sad, anxious or self-confident. Music is also connected to physiological responses within the body, including heart rate. The relationship between music and heart rate is complex and can be beneficial to health, especially for those who experience heart problems and chronic pain. A person's heart rate changes while listening to music, but whether the heart beats faster or slower depends on the tempo of the music. In the November 2009 issue of "Harvard Health Letter," studies performed at Massachusetts General Hospital and in medical facilities in Hong Kong show that people who listened to music for 20 to 30 minutes each day had lower blood pressure and a slowed heart rate compared with those who did not listen to music. A University of Oxford study reported by Australia's ABC News in Science explains that music with a faster rhythm, such as rap, increases a person's heart rate, instead of providing a relaxing effect. Whether or not a person has a background in the arts, specifically music, may determine just how much her heart rate is altered while listening to music. Dr. Peter Sleight, lead researcher of the University of Oxford music study, compared heart rate changes according to musical training. The musicians in the study group were found to breathe faster and experience more of a heart rate increase than those who did not have a musical education. The suggested reason for this phenomenon is that musicians understand the complexity of the rhythms of music and unconsciously adjust their bodies' respiration and heart rates to match the beat. In addition to lowering blood pressure and heart rate--in some cases, when the music is slow--listening to music can reduce the perception of pain in some people. Minneapolis' Abbott Northwestern Hospital reports that heart patients who listened to music felt less pain and were not as worried about their medical conditions than their counterparts who did not enjoy music. 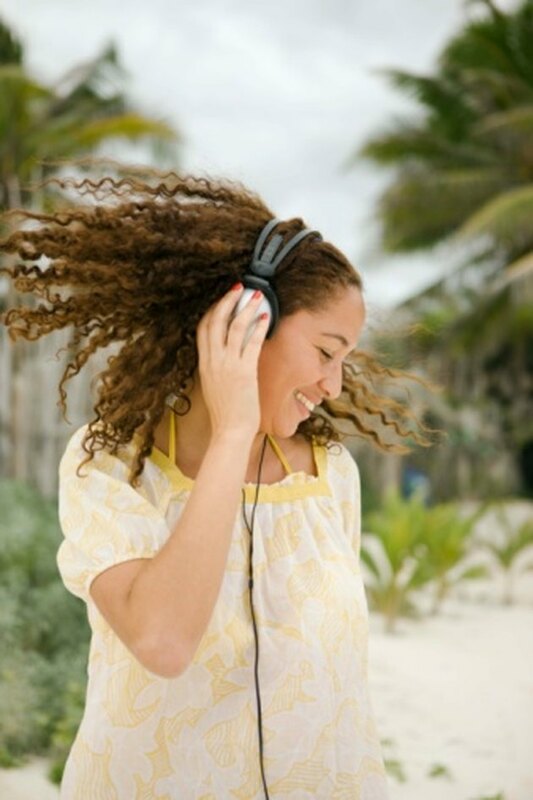 Music as a relaxation technique can cause a racing heart to slow down simply because it can relieve stress to some degree; a person's heart rate and blood pressure often rise during times of duress and anxiety. A study reported in a 2002 issue of "The Sports Journal," a publication of the United States Sports Academy, showed that listening to music while running laps around a track led to a decrease in lap pace. Participants who listened to music as they worked out did show the usual heart rate increase that is associated with aerobic exercise, but a smaller increase than those who did not listen to music. However, similar to patients who felt less pain when exposed to music, the athletes who were provided with music perceived a lower exertion rate than their counterparts who ran without an accompanying soundtrack. These findings are somewhat contradictory with those of Sleight, who suggests that athletes may improve their performance with the addition of music, but as stated in the "Harvard Health Letter," varied results to studies involving heart rate and outside factors are normal due to each person's musical preference; music that is relaxing to one person may not be another's favorite music and can actually cause heart rate to accelerate. New technological advances may make it possible to match a person's musical library to her heart rate. MP3 players that act as a heart rate monitor and a pedometer as well as a music player automatically select music to complement a user's heart rate. Consumers are required to program in selections they think will help them achieve their fitness goals; the selected songs will play as the consumer reaches her target heart rate. How Does Music Affect Teenagers' Emotions? Can Music Be a Bad Influence on Kids & Teens?